Pioneering stem cell heart surgery: surgeons have, for the first time, used a combination of an artificial heart and stem cells to save the life of a dying man. 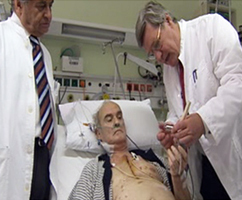 The stem cell heart surgery was led by British surgeon, Professor Stephen Westaby. He has pioneered the use of mechanical pumps in patients suffering from heart failure. But the NHS will not pay for the treatment. Instead he relies on charity funding – or travels abroad to implant pumps in countries where governments are prepared to fund the £60,000 devices.